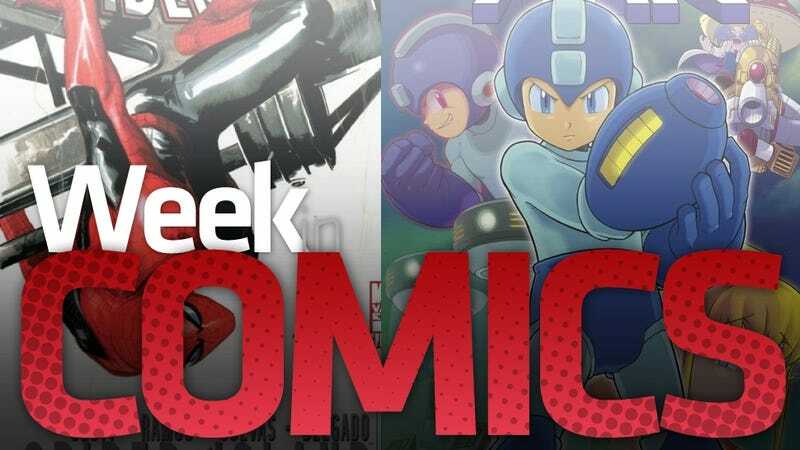 There are new comics out every week, but this week doesn't just have a strong batch of new books that are hitting store shelves. It's also got an unusually strong amount of legitimate digital downloadable comics, including a re-issuing of a few issues of the Detroit-era Justice League of America. You know, the worst incarnation of the team and therefore a great one. Amazing Spider-Man #667 Do you care about the new Spider-Island event that involves all sorts of regular people—eight million of them—in Manhattan gaining Spider-Man powers? Batgirl #24, Detective Comics #881 and Thunder Agents #10 With DC Comics re-launching their line next month, all of their monthly books are ending this month. That includes these three, all well-loved for their sharp writing. Thunder Agents will return, as will Detective, the latter under a different creative team. But for fans of the Stephanie Brown version of Batgirl, she's not coming back. This is it for her. Next month's Batgirl #1 puts Barbara Gordon back in the costume she made famous. DC Retroactive: Justice League: The '80s It's a new comic starring the lamest version of the Justice League, the one that was based in Detroit. Morning Glories #11 Nick Spencer is my favorite new-ish writer in comics, but I still haven't read an issue yet of what is supposed to be his best series. So while he does have a new Cloak & Dagger mini-series starting this week, if you, like me, want to read his best, we need to get on board with this series that I think is about a prep school. Red Wing #2 Time for a new issue about FF writer Jonathan Hickman's time-traveling fighter pilots. The first issue was lovely. Vertigo Resurrected: Jonny Double #1 This is a collection of some old work by the 100 Bullets team of Eduardo Risso and Brian Azzarello. That means it is probably excellent. Official summary: "San Francisco P.I. Jonny Double is hired to watch over a rich man's rebellious daughter. But after being seduced by the girl, Jonny finds himself mixed up in a scheme to plunder an old bank account that belonged to Al Capone." Mega Man #4 Official summary: "Let the Games Begin!' Part Four: This is it! Mega Man has reached Dr. Wily's stronghold, and now nothing stands between him and the madman! Except the Yellow Devil. And the Copy Robot. And the rebuilt Robot Masters. Good luck, Mega Man! Don't miss the finale to the first arc to this brand new series!" Mega Man Gigamix Vol 2 Official summary: "The original blue bomber is back for more action-packed adventures in Mega Man Gigamax! In volume 2, the ultra powerful Stardroids appear with only one goal - the destruction of the planet Earth! Mega Man, Dr. Wily, Dr. Light, and all the Robot Masters, good and evil alike, must join forces to protect the world from these evil alien automatons!" Mega Man Tribute Not exactly a comic, but here's the official summary: "Hundreds of artists from around the world join forces to pay homage to one of the most iconic figures in gaming with Mega Man Tribute! It's the ultimate celebration of the blue bomber, featuring the characters of Mega Man classic, Mega Man X, Mega Man Zero, Mega Man ZX, and Mega Man Legends in every style you can imagine! No fan of great artwork, video games, or Mega Man would dare miss out on this 300-page artistic extravaganza!" Star Wars: The Old Republic: Lost Suns #3 Official Summary: "The war that ended in a tense peace agreement is in danger of beginning again, but elite Republic spy Theron Shan is going to do everything in his power to prevent it-including infiltrating the Imperial space of Darth Mekhis to find out what is happening! Along with Master Zho, and the criminal in his custody, Teff'ith, Theron is headed to Port Nowhere. He hasn't got a plan or any idea what he may be going to face, but for a spy, he's got great style!" The ComiXology Comics app and website offer a fresh batch of new and old digital comics this week (and as of this week, Marvel's are available on Comixology's website, instead of just on iOS… but still not on Droid). Highlights this week include some wonderful-looking barely-pre-Crisis issues of Action Comics that have Superman hanging out with the Forgotten Heroes and starring in some issue that has a cover showing kids drawing Superman under a big arrow filled with the text: "If Superman didn't exist, someone would have to create him." I expect cheese and welcome it. They've also added the first 11 issues of Kurt Busiek's Avengers run, a few issues of William Messner-Loebs' '80s Flash run, some old issues of the JLA's Detroit team, the first 12 issues of the I-heard-it-was-very-good series Resurrection Man, the beginning of Jonathan Hickman's Secret Warriors run, and another of Rick Geary's Treasury of Victorian Murder books, this one about the assassination of President James Garfield. Nothing worth recommending, I'm sorry to say. I continue to flea from Fear Itself whose crossovers I spilled some money on. They're going in the recycling.